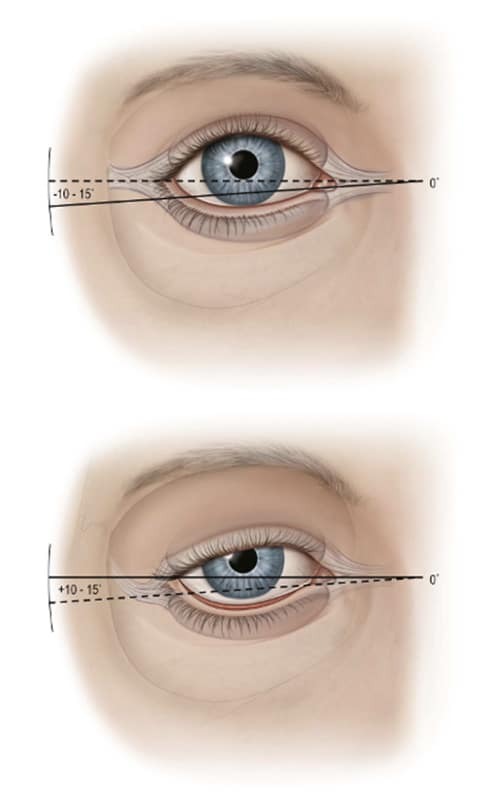 The eyelid has a complex anatomy so oculoplastic surgeons need to work within millimetres to achieve desired results. Certainly, patients requiring revision blepharoplasty vary greatly in the complexity of the problem, from minor degrees of scarring to severe eyelid malposition affecting the integrity of the eye and its ability to function correctly. So, while eyelid skin typically heals very well it can, on occasions, be too vigorous. This leads to noticeable scars and bumps around the incision areas which can usually be effectively managed with scar revision procedures. Another problem can arise when the original eyelid surgery under-corrected the initial concerns or issues. In this instance, not enough skin was removed and/or the muscle that lifts the eyelid was not sufficiently tightened during an initial blepharoplasty procedure or ptosis surgery. When this occurs the face appears older and "heavier" looking. Often the eyelid(s) appear puffy and tired and the upper field of vision can be impaired. At other times, over removal of the eyelid can cause severe issues for the patient. The most severe complications arise from changes in the lower eyelid contour which lead to retraction and greater exposure of the eye. For example, the removal of too much soft tissue and skin from the lower eyelid can result in an increased amount of the white sclera (i.e. the white, outer layer of the eyeball) to show whilst the lower eyelid hangs below the coloured iris. Lower lid retraction changes are complex. They can cause severe soreness and dryness as well as devastating aesthetic results for the individual. The lower eyelids sag, revealing more of the white of your eye than normal (sclera show). A revisional lower blepharoplasty is ideal for correcting your eye contour and giving a more natural shape. Usually, a retractor release and canthal suspension can be enough to restore eyelid position in mild cases. However, In the most severe cases where excess skin and fat have been removed, different layers of the eyelid will need to be built up. This is done by applying a range of materials, such as hard palate grafts, to the internal lining of the lid. However, where excess skin removal is the underlying issue, every possible avenue is explored to prevent skin grafting. Our consultants recommend multiplane midface lifting in order to recruit more skin into the eyelid area. Another common complaint when too much skin or fat is removed is the poor positioning of the eyelids. An asymmetrical, unbalanced and somewhat unnatural appearance can result. Blepharoplasty revision can be conducted in order to realign everything so that the previous symmetry can be restored. A hollow, sunken look under the eyes may also occur if excessive fat has been removed from the area. By injecting fillers or fat transfer the lower and/or upper eyelids can get volume for a youthful look. The images opposite demonstrate very typical complications from blepharoplasty with sagging of the eyelid laterally, and in more severe cases, loss of intercanthal tilt and ectropion. These changes can be aesthetically devastating and also cause significant eye pain, discomfort and vision loss. 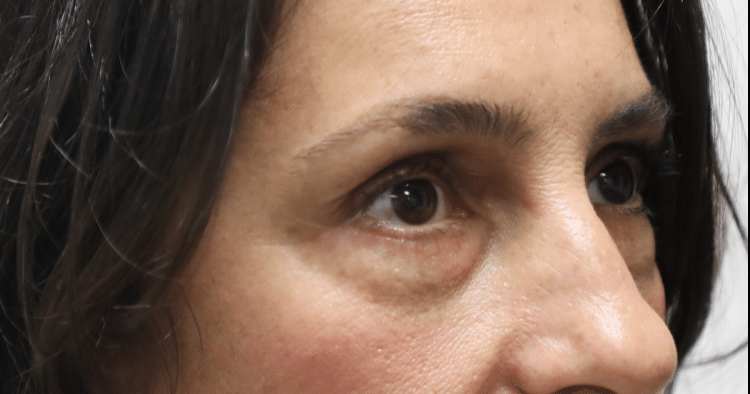 It's important to note that not all cosmetic eyelid surgeons have the correct skills or training to deliver the results their patients are looking for. Blepharoplasty (of any form) is a very delicate operation and mistakes are not easily forgiven. Even eyelid revision surgery is susceptible to some scarring. Certainly, the degree of scarring after revision blepharoplasty is dependent upon a number of factors. These include how the initial blepharoplasty operation went, the surgeon, the ethnicity of the patient and their individual genetics and healing predisposition.This is why we always welcome patients to meet our specialist consultant, Mr. Daniel Ezra, and talk in-depth about the procedure and what the post-surgery results are typically going to be. As one of London's leading oculoplastic surgeons, he uses a range of reconstructive techniques to restore the position and functionality of the eyelid. With his wealth of experience he will operate in cases where he feels he can achieve a substantial improvement that is within the patient expectations. If he can't then he'll advise against further surgery.